Well, I’m back! I’ve been busy remodeling my home and my life. Lots going on – which I will be posting about. Meanwhile, in case you didn’t already know, I love to cook and try new recipes. My family loves my cooking and I am often called upon to whip up something. This cake was created for my brother’s birthday this past Sunday. It came as a thought and my dd#2 asked about having cake for dinner, so it didn’t take much encouragement for the thought to become a reality. 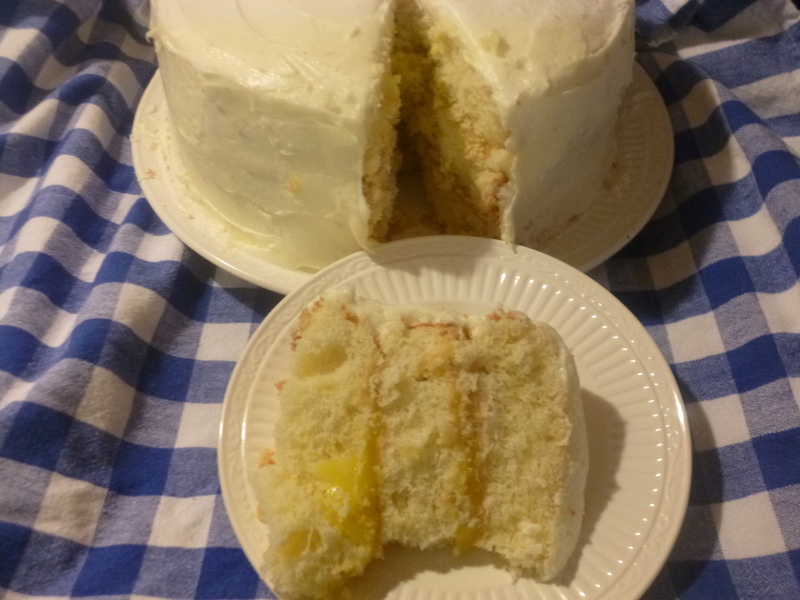 Now I am asking that you forgive my crude photographs–I’m new at this–and yes, I could have sliced that first slice better, but honestly, I wasn’t thinking about taking pics when I sliced it. Can you guess what was on my mind? 1. Grease three cake pans (I used 9 inch). Line cake pans with waxed paper or light dusting of flour. 2. Sift flour 2 to 3 times. 3. Add baking powder to flour and set aside. 4. On medium speed, cream butter and sugar until mixture is light and fluffy. 5. Continue to mix and add eggs one at a time. 6. Add vanilla, lemon, and cooking oil. 7. (Now here’s the tricky part) divide flour into four parts, add one part to mixing bowl, mix well, then add one third of milk, another fourth of flour, another third of milk, etc. Your addition of flour and milk should be flour/milk/flour/milk/flour/milk/flour. Mix well after each addition. This process should not take longer than two minutes. Overmixing after adding flour can lead to problems. A good rule of thumb is to stop mixing when no streaks of flour remain in your mixing bowl. 8. Pour batter evenly into prepared cake pans. Bake for 25-30 minutes or until cake in light golden brown. Remove from oven and let cool. Place all frosting ingredients in bowl and mix well. Mixture should be fluffy, light and smooth. Place first cake layer face down on plate. (remove waxed paper). Spread lemon pie filling on layer. Add second layer and add lemon pie filling. Add top layer (face up) and frost cake sides and top. That’s it! I hope I didn’t leave anything out. Try this soon — the cream cheese frosting and the lemon filling really makes this an ‘over the top’ cake. Great for pot luck and family gatherings. I guarantee you will come home with an empty plate! As always, comments are welcome. I HATE cooking and find it tres boring. Thank gawd for people like YOU. You cook, I’ll do the dishes, girl. P.S. I make goat milk soap and people say soapmaking is similar to cooking because a recipe is used and some soap recipes require “cooking” of the soap. Did I tell you, I HATE cooking (still). Ha ha ha. Thank you Lyric! I used to hate cooking too because I thought it was too hard. However, after two husbands and two children, I learned it wasn’t hard. It’s like a science project. I want to learn soap making too–I love to create. Thanks for reading.